Don't Let Go - It's the Cleveland Gladiators at @TheQArena! We were given tickets to facilitate this post. Opinions are my own. I've never been one of those gals who mourned her husband during football season, but I certainly wasn't watching it with him on purpose either. When I was waiting tables, I would watch just enough so that I could talk about it with my customers or maybe impress a guy. I actually felt that I knew nothing about football or at least I did until this past Saturday. We were invited to attend a Cleveland Gladiators game this past Saturday and I have to admit the main reason I said yes was that 38 Special would be performing. I can't tell you how many times I've listened to Hold on Loosely or Caught Up in You! I can tell you that this was my first arena football experience and I must say it was a whole lot of fun! Just like the Monster's Hockey games I've attended, poster making, hair coloring, and face painting were there for the kids along with fun audience participation games. We deliberately get there an hour early to do these things all in the hopes of appearing on the jumbotron. Okay, I don't want to be there but the kids do. Of course, this time only two were up there as I took the other to the restroom but the little one and I did make it from our Instagram post. I really love how so many events have been incorporating social media to make events truly a fan experience. I honestly don't think there is a bad seat for the game. Arena football is not as big as a regular football game so no matter where you sit, you see the action. The replays on the big screens also help but I never felt like I was missing something. This is important if you football education has a few holes in it. Sadly, our Cleveland Gladiators did not win, but they played their hardest to the bitter end. I also discovered that I know way more about football than I originally thought. Baby girl was so into the game and kept asking me questions that were relevant and I could answer them! Of course, explaining the basics of football to a five-year-old may not seem like a big deal, but it is! What I need is a football crash course. 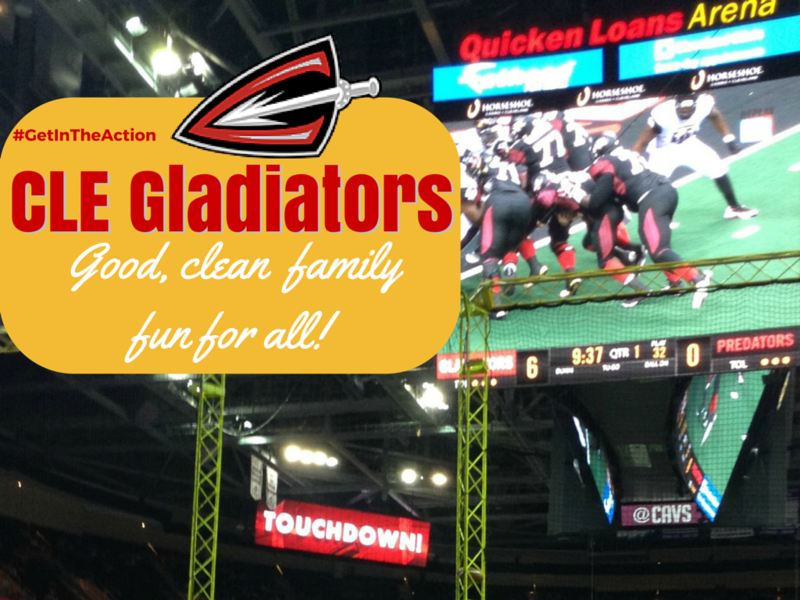 Don't miss this chance to cheer on our Cleveland Gladiators!